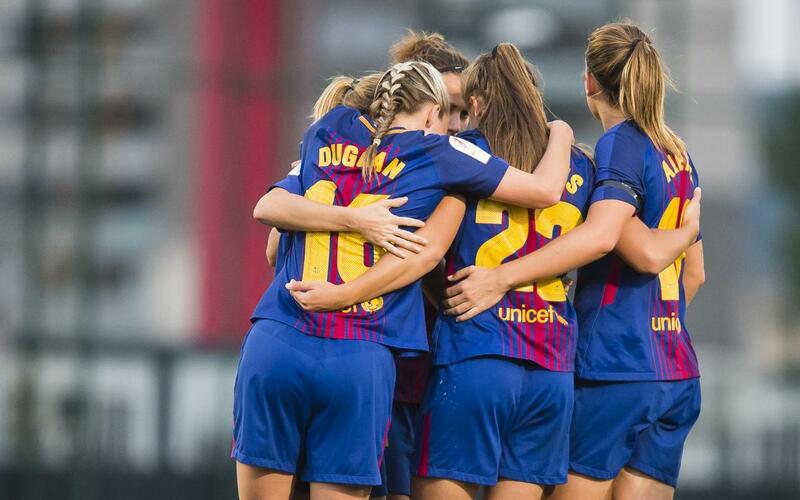 Barça Women won the derby after defeating Espanyol 4-0. The Blaugrana found that the way to break the visitors' resolute defence was with shots from distance and passing into space, allowing the speed of their wide players to prove decisive. Goals from Mapi, Martens (2) and Duggan put Fran Sánchez’s side top of the League, after Atlético Madrid were beaten by Rayo (0-1). Bárbara Latorre and Lieke Martens had early chances to open the scoring for the hosts, but it would take until the eighth minute before Mapi León got on the end of a ball from Andonova (1-0). After the goal, all of the pressure came from Barça, and the only surprise was that their second didn’t arrive, through Martens, until two minutes before half-time. Espanyol were more offensive after the break but without success. Martens crashed a shot against the bar and Toni Duggan's follow up went well wide, but the latter wasn’t to be denied, making it 3-0 on 72 minutes after keeping her head in a one-on-one. Martens’ second sealed the victory, rounding the keeper after Alexia's assist (4- 0, min 83).